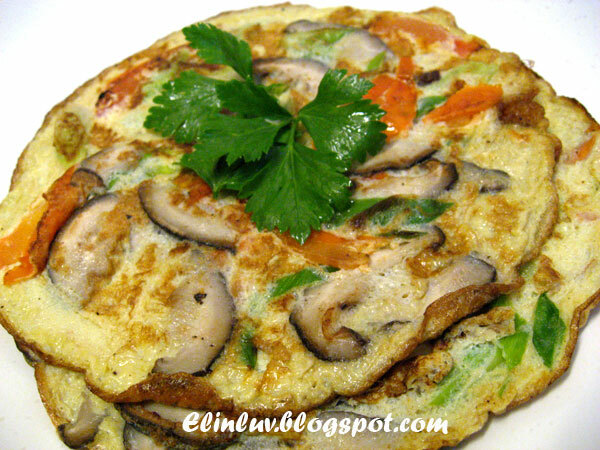 An omelette or omelet is a dish made from beaten eggs quickly cooked with butter or oil in a frying pan, sometimes folded around a filling such as cheese, vegetables, meat (often ham), or some combination of the above. To obtain a fluffy texture, whole eggs or sometimes egg whites only are beaten with a small amount of milk or cream, or even water, the idea being to have "bubbles" of water vapor trapped within the rapidly cooked egg. 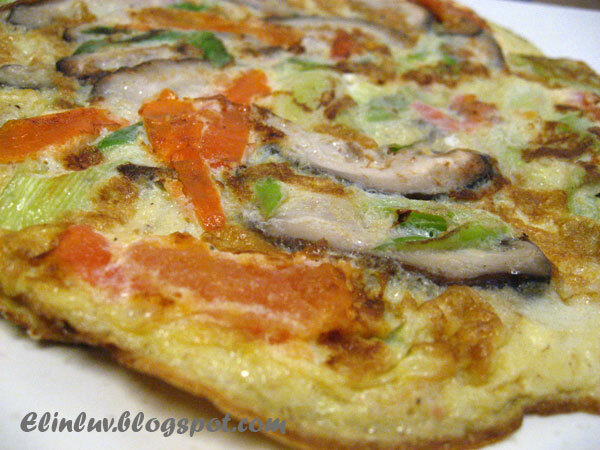 The bubbles are what make the omelette light and fluffy.Omelettes may be only partially cooked on the top side and not flipped, even prior to folding. This dish is thought to have travelled to Western Europe via the Middle East and North Africa, with each country adapting the original recipe to produce Italian frittata, Spanish tortilla and the French omelette. An Iranian Omelet is made of egg and tomato and sometime pepper. In Iran Beaten eggs quickly cooked with butter or oil in a frying pan is called "Khagine". 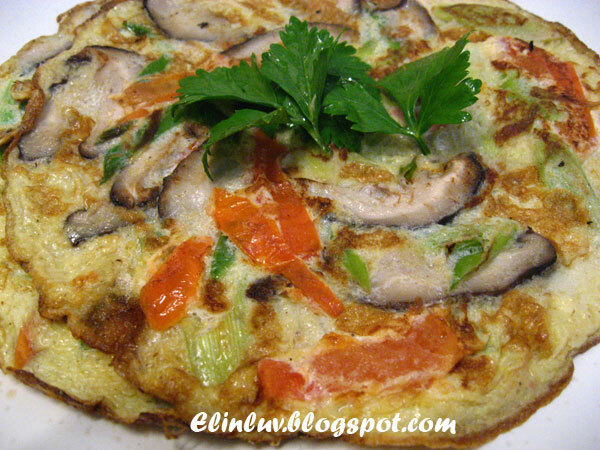 A Chinese omelette can be egg foo yung or an oyster omelette. Debilovka - [Дебиловка] traditional omelette, initially issued by Jewish-Russian immigrants in Israel. Colorful combination of wide variety of canned and frozen vegetables, cold cuts and regional spices. A Denver omelette, also known as a Western omelette, is an omelette filled with diced ham, onions, and green bell peppers, though there are many variations on fillings. Often served in the midwestern United States, this omelette sometimes has a topping of cheese and a side dish of hashbrowns or fried potatoes. An egg white omelette is a variation which omits the yolks to remove fat and cholesterol, which reside exclusively in the yolk portion of an egg. 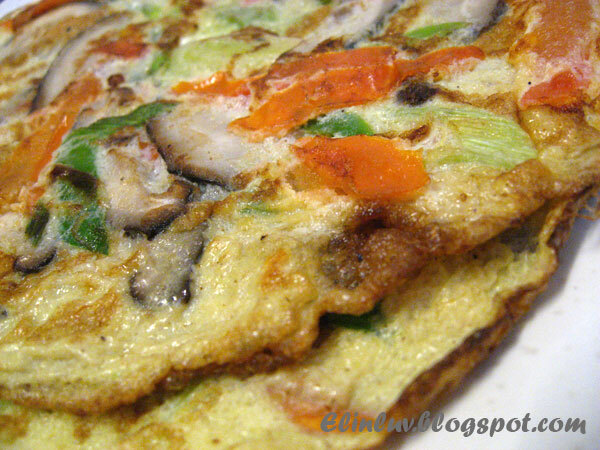 The French omelette is smoothly and briskly cooked in a very, very hot pan specially made for the purpose. The technique relies on clarified butter (to ensure a high smoke point) in relatively great ratio to the eggs (prevents sticking and cooks the eggs more quickly). Good with just salt and pepper, this omelette is often flavored with tomatoes and finely chopped herbs (often fines herbes or tarragon, chervil, rosemary and thyme) or chopped onions. French omelettes are also removed from the pan in a manner different from an American omelette. They can be rolled out in a trifold design or just simply slide out of the pan directly into a plate and when made correctly have little to no color on them. 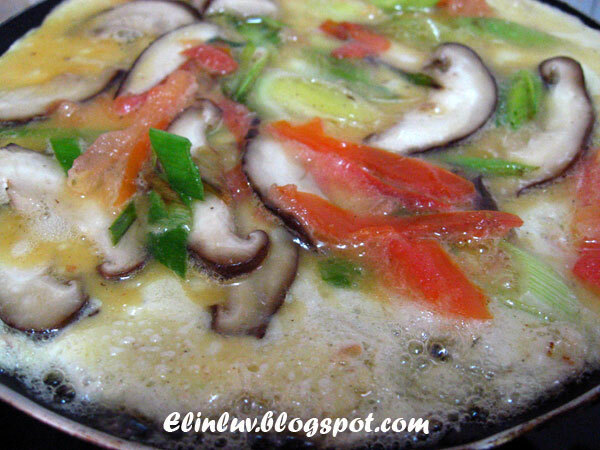 Frittata is a kind of open-faced Italian omelette that can contain cheese, vegetables, or even leftover pasta. Frittate are cooked slowly. Except for the cooking oil, all ingredients are fully mixed with the eggs before cooking starts. 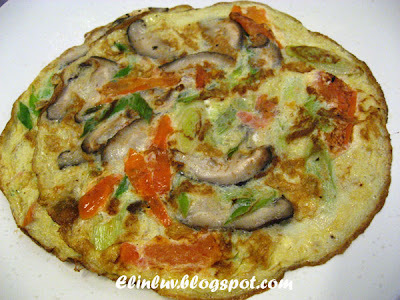 Indian OmeletteAn Indian Omelette is usually made with the addition of spices which vary by region. Most commonly used are finely chopped green chilies, chopped onions, coriander leaf or powder, cumin and a pinch of turmeric, all of which are added to the egg before it is whisked. An exception to this is the tomato omelette which doesn't contain egg, but is called an omelette simply because of its resemblance to an omelette. In Japan, Tamagoyaki is a traditional Omelette. Omelette (pronounced omuretsu) can mean a western omelette. Omurice (from the English words "omelette" and "rice") is an omelette filled with rice and usually served with a large amount of tomato ketchup. Omu-soba is an omelette with yakisoba as its filling. In Mexico, omelette (pronounced omletta) can have many of the same ingredients as a western omelette. In the Netherlands, a "Boerenomelet" (literally: farmers omelet) is most favored. It usually consists of: eggs (2 to 3), a mixture of onions (baked), mushrooms, bell peppers, leek, seed-pod peas (or in Dutch: doperwten), salt and pepper (for seasoning). Some folk prefer their own variation on this recipe. The Spanish tortilla de patatas is a traditional and very popular thick omelette containing sliced potatoes sautéed in cooking oil. It often includes sliced onions too (tortilla de patata con cebolla), and less commonly other additional fillings such as cheese, bell peppers, and cooked diced ham. In Morocco, common omelettes are called tortillas as well. They have the same ingredients as the Spanish, except for added cumin and fleur de sel. A Thai omelette can be a kai yat sai which means literally "eggs, filled with stuffing". In the United States, a Spanish omelette is an omelette served with an often spicy sauce of tomatoes, onions, and bell peppers. A Hangtown fry, containing bacon and breaded oysters, is an unusual omelette which originated in Placerville, California during the gold rush. Telur dadar is a flat, Indonesian omelette-style side dish usually eaten with rice, consisting of eggs pan-fried with chillies and onions. It also can be found in Malaysia. In the Philippines, the term for omelette is torta - not to be confused with the Mexican torta (sandwich), Italian torta (pie) or the Spanish torta (cake). Generally served for breakfast, countless fillings such as onions, garlic, tomatoes, corned beef, potatoes, bell peppers, raisins and possibly leftovers from previous day's meal like grilled eggplant, ground, chopped or shredded pork and beef are used. It is eaten by itself or served with garlic fried rice and banana ketchup on the side. Take a bowl and break 2 eggs into it. Add salt and pepper to it. Beat well . Add in the cut veggies and mix well . Under medium heat , heat up a non-stick crepes pan , add 1 tbsp grapeseed oil to it. Pour in the egg mixture. When it is cooked on the bottom side, gently flip over .and dish up when it is cooked both sides. Serve as breakfast food or supper or as side dish . This sounds so healthy. 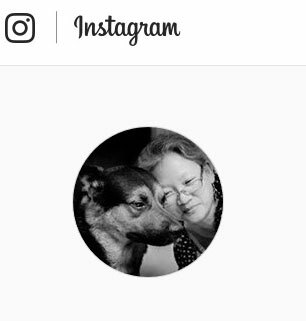 I don't mind to eat more than one serving. That's interesting info on omelettes Elin, although the word 'omelette' does seem like a french spelling! I find it's very adaptable for a wkend lunch when I can't decide what to make for hubbs lunch - he's not a sandwich fan. I tend to make a spanish omelette style with cooked cubes of potato and any other veggies hanging around. Love omelettes too! So versatile and so yummy with rice! Beautiful omelet! Whenever I make omelets, they always end up turning into scrambles :) We are watching our cholesterol also, so I've been making them with egg whites only. They are still delicious that way, and very low cal! Nicely fried Omelette! I can just eat this with a bowl of rice. Really wish someone could cook this for me. Wow, so now you're an expert on omelettes! Never thought of adding leeks in it, must try! A great easy homey dish...and delicious too!